Because we play so many different games in the TDAA we’re always faced with the riddle for setting time for games and consequently, qualifying criteria. 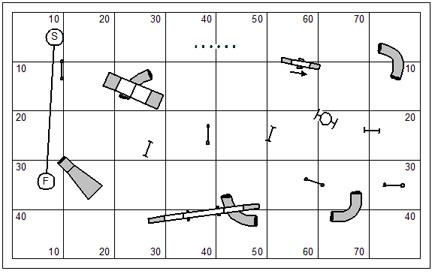 The Qualifying Course Time (QCT) has several possible approaches to be solved. This is actually kind of easy. You can apply the rates of travel from the standard classes at the same basic level. But there can be some thinking involved. Unlike the standard classes in which the YPS rates of travel are fixed, games allow for a range in the rates of travel. I know we all have them memorized, so I won’t bother to recite them here. But do expect them to be on the next judges’ exam you take. 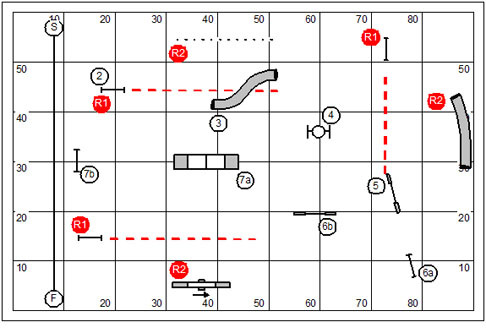 If a course/sequence has a good number of technical obstacles and technical options then you should use the smaller number in the range; if the course/sequence is fast and mostly made up of jumps and tunnels, then you should use the larger number in the range. I had a judge once submit to me a Minuet course using 8 jumps in the sequence; and also requiring the traditional number of books to qualify: (GI = 3; GII = 5; and GIII = 7); all in a QCT of 50 seconds. I wrote him back and pointed out that the GIII dog would have to do 56 jumps in 50 seconds in order to qualify (and suggested that he revisit the qualifying criteria). Almost any game designed by a judge deserves a bit of “What Would You Do?” analysis. 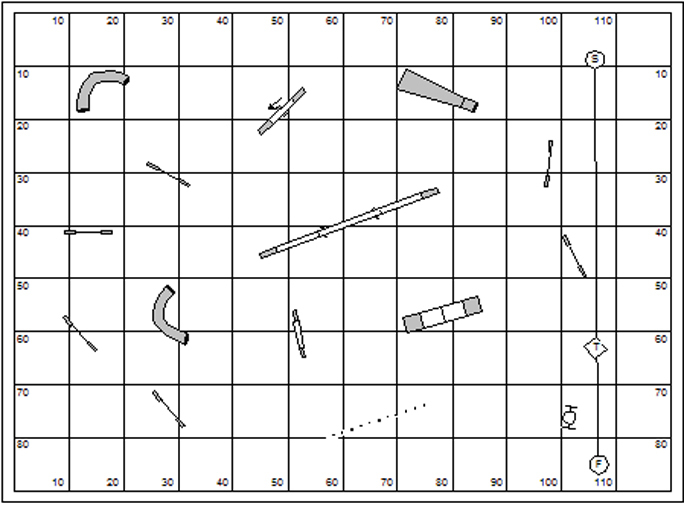 That means the judge/course designer will trace through and measure several possible strategies for the dog’s choice game. From these the judge can modestly extrapolate things like how many points a dog should score and how long he should be given to play. 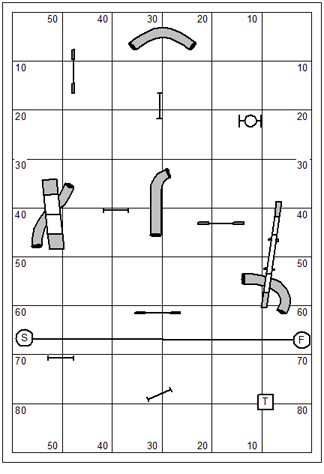 Often when reviewing courses I’ll ask the judge if he will draw me a possible strategy or two. This should be easy to do as there’s probably one or two on his computer already. You see… I’m an optimist. From the judge’s own idea of strategy I can talk about performance constraints of the game. Almost always the measured path of the dog can be compared to the rates of travel from the standard classes to determine if either the points required to qualify or the time provided to score points are reasonable. 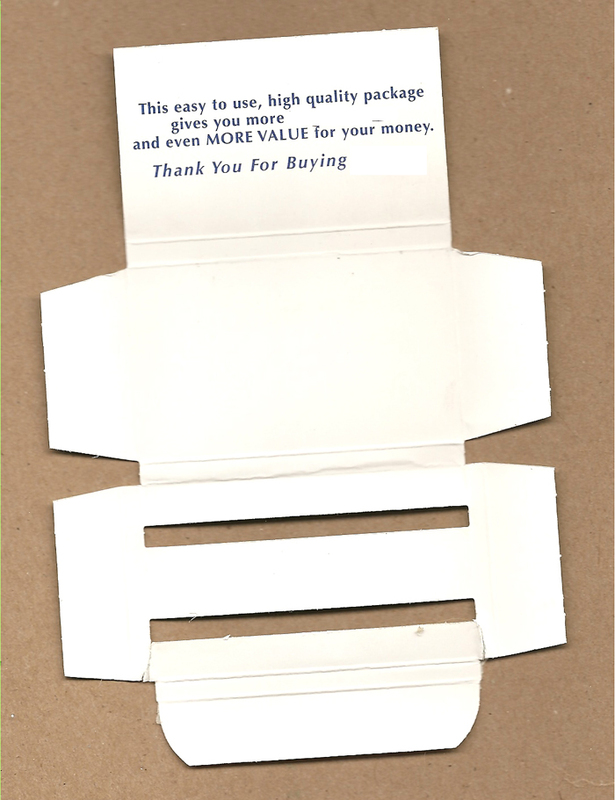 Multiply the highest value in the scoring system by the QCT/10. In Gamblers there are two traditional point systems: 1-2-3-5 and 1-3-5-7. So the high values of those systems are “5” and “7”. The point accumulation period might be 30 seconds, or maybe 40 seconds. Divide either of those numbers by 10 and you’ll have a value of “3” or “4”. The 1-3-5-7 system in 40 seconds requires 28 points to qualify (7*4=28). This logic can be used in any game in which the pointing system is comparably straight-forward. You have to watch out for pointed games that have null value obstacles. In games like The Weakest Link, for example, the dog is required to periodically take the tire which has no inherent value of its own; so it will skew the points accumulated and possibly cause the judge to ask for more points to qualify than are reasonable for a good percentage of the class. I’m going to post to the TDAA Judges list on Yahoo today a file named: QCT Calculator.xls. This is a simple analysis tool for making a ballpark guess as to how to set a Qualifying Course Time when you generally know how many yards the dog will have to work in order to qualify. The calculator can help you set a realistic QCT (course time) or amend your expectations of what the dog will accomplish. After all, we don’t really want to set course times of two and three minutes. The number in the dark blue cell/gold lettering can be modified, and will set the start point for this table. The leftmost column shows what to add to the base SCT to get the high end of the range for games. In the analysis you’ll go row by row and find where the yardage fits. Just look at the top of the column to find where you’d set the QCT. Note that if it’s a “fast” course (jumps and tunnels) you’d want to use the lower time; if it’s a technical course (contacts and weave poles) you would use the upper. Here’s a simple numbered course. You no more want to guess at it’s overall length than you want the time-keeper guessing at a dog’s time on course. Yes, I know you’re going to measure it when you build it. But you can measure it in the design tool as well. To view the Path tool, click on the Path Tool button, shown here. 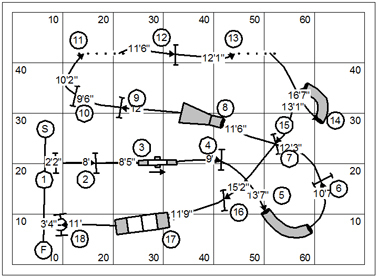 This is especially useful for getting a good look at the distance you’ve put between obstacles in your course design: Nice short transitions in the straight-away; 12′ or more in the turn or on the approach to a technical challenge. Sometimes you have to look pretty hard to find the number. It’s always midway. In this case you can see the number up on the weave poles at #11. The length of the path is 86.9… or you can call it a nice round 87 yards. 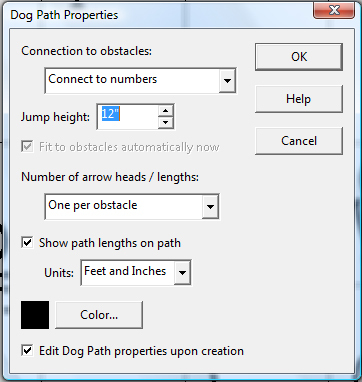 In the Clean Run Course Designer how do you “hide” the dog’s path so that you can remove it from the course map for printing without actually deleting it? Questions comments & impassioned speeches to Bud Houston: BudHouston@hughes.net. Check7 out my latest publication the Jokers Notebook ~ Dog Agility Distance Training ~ Issue #0 ~ August 2010 available on the Country Dream Web Store: http://countrydream.wordpress.com/web-store/ . Readers of my web log get a discount: Enter “special00” in the box for the discount code. And that will take $5.00 off the price of the order. I didn’t really watch Westminster. I know it’s a big deal in the conformation world. But I was occupied yesterday by other priorities. Busy busy busy. That’s me. I did get a look at the Wolf Hound. What a handsome fellow. Among the many projects that I’ve got working, I continue to work on the Games Book 3d ed. I’ve managed to take a perfectly silly and fun game (Cherry Picking, below) and document it a completely serious and erudite manner. The book is at about 500 pages right now. I’m considering marketing it as a beta product. That means I will have to update everyone with the final version. In the mean time, they will all have the most comprehensive reference to agility games that exists in the world today. I’ll be geeking out the final version of course. That means I want the capability for the reader of the PDF to click on the upper-right corner of the course map and spawn it right away into Clean Run Course Designer. That kinda solves the tabula rasa problem that a lot of people have with designing their own courses. Sometimes called “Picking Cherries” this is a simple game invented by Bud Houston that can be played using the set of equipment from nearly any standard course without having to move equipment around at all. The game was originally designed to teach a unique Snookeresque skill, the ability to move a dog across the field without taking obstacles that might be in his path. The purpose of this game is to direct the dog only through the performance of the “cherries” which can be defined as “all the round things”: tunnels and tire; and, at the judges discretion, the weave poles. This is a dog’s choice game, so refusals are not faulted. If the dog takes an obstacle other than a cherry, his game is over and must leave the course. This is an adaptation of a standard course. There was no real attempt to “design” the Cherry Picking course. All the ring crew has to do is pick up any number cones and then define the start and finish line. The judge might turn around the one-directional obstacles or possibly reshape the tunnels to make the challenge more interesting. Resist the temptation in this game (or any dog’s choice game) to start and/or finish on the table. Defining the start or finish points for a dog will do little more than limit possible strategies. This is really such a simple game. I’ll often play Pickin’ Cherries to break the tedium of handling drills or when I’m feeling a bit of paralysis by analysis in my students when doing numbered courses. The purpose of this game is to pick off all of the tunnels on the floor without doing any other obstacle. On this course the start and finish line are a common line. So, we may start anywhere across the front of the course, and finish anywhere on the same line. Pickin’ Cherries is a dog’s choice game. That means we can pick off the tunnels in the order and direction of our choosing. The game is scored time plus faults. Doing any obstacle other than a pipe tunnel will result in a 5 second fault. Tunnels may be repeated without fault… if you think that’s actually an effective strategy for the game. Traditionally Cherry Picking is scored Time Only. Dog’s that take an obstacle other than a “round thing” will be scored Elimination. The game might also be played Time, Plus Faults. In either case the judge will set an aggressive Qualifying Course Time (QCT). If the dog’s score is less than the QCT he will qualify. This game requires both strategy and skill. The handler might want to cultivate the ability to begin the game by drawing the dog across the field from the start line to pick off the most difficult obstacle. This is a skill that is useful in games like Snooker and certainly in Picking Cherries. Also look for flow. Dog’s choice games are often won or lost by the brefity of the dog’s path. In the second example course (above) ~ Most Pickin’ Cherries course are considerably harder than this as we often have to move the dog across the field avoiding obstacles placed obtrusively in the dog’s path. As it happens, this set of the floor makes for about the prettiest Cherries course I’ve ever seen. Two essential strategies emerge, both being the same overall length. And yet, even from a simple game like this there are lessons to be learned. Either of the two possible strategies must begin with the approach to an obstacle discrimination puzzle. How does a handler solve a discrimination puzzle? 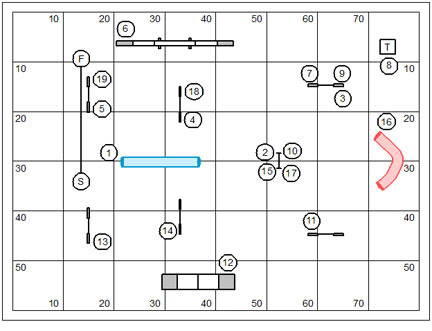 What can go wrong in the transition to and from pipe tunnel at the back of the floor (at the top of the course map)? Note that in a Time, Plus Faults game the weight of the penalty should coincide in point value with the schedule of faults in the standard classes. 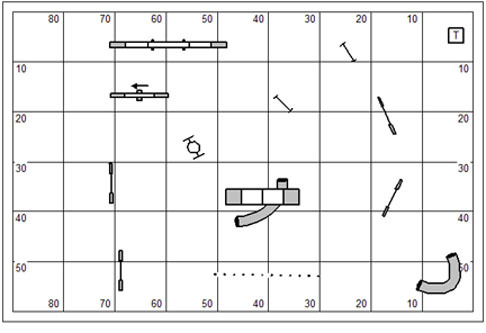 And weave pole faults in the games classes should reflect the performance required in the standard classes. Taking an obstacle that is not in the target group (e.g. “round things”) is equivalent to a wrong course. However, the judge should aggregate the penalty, meaning that the fault is earned for each wrong obstacle performed; otherwise it might be a perfectly acceptable strategy to intentionally take a wrong course line on the course. Establishing a QCT in any dog’s choice game is a bit of an art form. The easy thing for the judge to do is find one or two possible strategies and them measure them, applying liberal rates of travel from the standard classes in order to set the QCT. We don’t really want to encourage any handler to “heel” his dog around the course so the QCT should be aggressive enough to make the dog actually run. But don’t be so aggressive that all the Yorkies fail the test just because their leg’s are only 3″ long. As a rule of thumb the QCT will be about 20 seconds on the low end, and certainly no more than 30 seconds on the high. Jumps Variation ~ rather than to the round things, the handler must direct the dog to perform all the jumps on course. It’s the judge’s choice whether the tire should be included. Cherry Picking is a qualifying game only in the TDAA and Top Dog. The dog earns a qualifying score for stopping time at or below the QCT. Picking Cherries is a simple dog’s choice game. The dog might be directed to as quickly as possible get all the tunnels on the course… and nothing else. Picking Cherries is scored Time Only. Please identify this packaging. Specific trumps generic. One of these days I want to share with you a good discussion on how to come up with qualifying criteria for points games. Not tonight though. Below I’ve given a gentle rewrite to the rules for “Copycat”. One of the embellishments I’m adding at the bottom of games documentation is what I call the “Premium Blurb”. This is really a problem area. When I review TDAA premiums I typically have to rewrite almost every games description. Someone has suggested that we need a solid catalog of games descriptions that the host club can plug into their premiums. The games book seemed like a logical place to put such a thing. Copycat is the invention of Trisha Stall from Latham, New York. Copycat is a “dog’s-choice” game. That means the handler can direct the dog through the performance of obstacles in the order and direction of his own choosing, or the dog’s choosing, as the case may be. The dog may perform each obstacle only twice for points. Obstacles must be correctly performed to earn points. If the dog performs obstacles of the same value one after the other the dog will earn a fault for “copycatting”. For each copycat fault the dog will be penalized 5 points; (and will not earn the value of the second obstacle). Every second over course time will be penalized one point. Copycat is scored Points, Less Faults, Then Time. The dog with the highest number of points wins. Time is a tiebreaker only. The scorekeeper is responsible for determining faults for copycatting. In a copycat sequence the dog is not awarded the value of the second obstacle. Time starts and stops when the dog crosses the start/finish line. The course should be designed with subtle traps for repeating two obstacles of the same value. 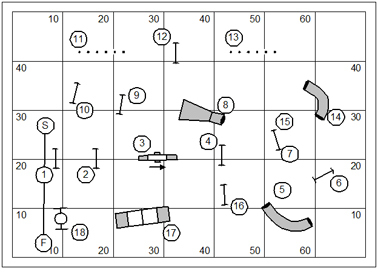 The line of jumps in the center of the course should obviously be avoided by the handler. Less obvious is the possibility of being trapped by the tunnels and tire at the right side of the course; and by the weave poles to teeter at the top of the course. Copycat is a dog’s-choice game. The handler’s job is to avoid taking two obstacles, one after another, of the same point value for which the dog earns a “copycatting” fault. Copycat is scored Points, Then Time. I’ve been working like a dog. That’s a curious expression, eh? No dog I’ve ever had did a lot of very hard work. Indeed most every one of them had more of a talent for napping than any particular labor. I haven’t written to my web log in quite awhile. I think this is the longest hiatus that I’ve taken. It’s not that I haven’t had things to say or to share. It’s just that the blog thing hasn’t risen to a level in my priorities list to warrant my effort. In other words, it becomes an indulgence for which I have to set aside something that really needs to be done. It’s not that it’s any less of an indulgence right now. I just wanted to take a moment to let everyone know that I’m alive. The business of the TDAA has kept me busy. We’re making gradual headway bringing under control systems that were designed for a small army of volunteers to conduct; and without the services of the small army. We’ll start the day tomorrow with a run of Ralphie’s Run ‘til You Drop. The design I have here has several hidden objectives. They’ll have to remain hidden for now. This was our Thursday night set-up. The set of equipment spawned about a dozen unique exercises. The numbered sequence I’ve put here Features several perilous options. Clearly I’m always looking to teach my students compelling and timely handling skills. This wasn’t so long ago. The drawing creates an interesting illusion that I’ve moved equipment around quite a bit. But it’s a cheat. Can you spot it? You didn’t get much from me today except to share a couple drawings. I’ll usually share a bit of prose that is inspired at the confluence between artistry and ego. But today I’ll leave you with just the pictures. 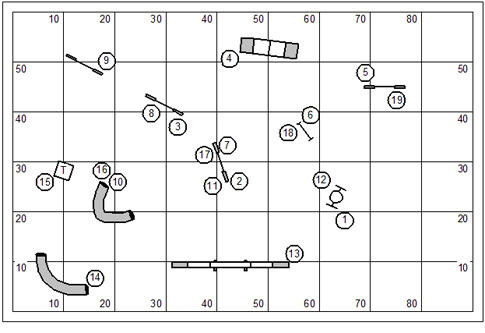 It is funny looking at a course map. It’s almost impossible to trace the dog’s path without the antics of the handler and the touchy response of the invisible dog superimposed on the imagination. I wonder sometimes what it is that you see. Anyhow, almost always my web log reflects what I’m working on at any given time. Today is no different. I’m installing software on a new computer. And, I have to make sure everything I use for my web log is installed… and it works. Do you know what all I use? I use Microsoft Word; the Clean Run Course Designer; Photoshop CS2; and of course Internet Explorer. I’ve been at it all day long. 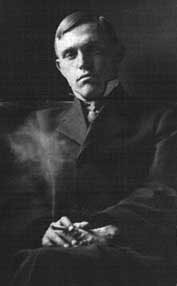 You are currently browsing the Bud Houston's Blog blog archives for February, 2011.